The ELITE ﻿Chef stainless steel pull-out multi-storage organiser is the latest in innovative storage design for modern kitchens. 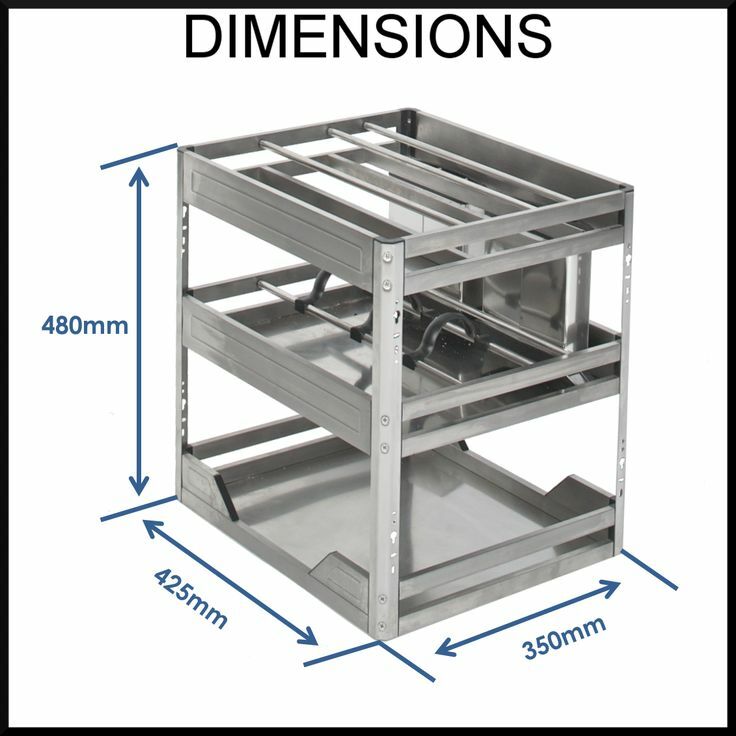 Designed for a standard 400mm wide under bench cupboard. It features soft close and provides convenient access to all your cooking utensils, oils, sauces, spices and other items. Get organised now! Earn $6 Reno Dollar for purchasing. The ELITE Chef stainless steel pull-out multi-storage organiser is the latest in storage design for modern kitchens. Forget about the old tradition of installing shelves in your under-bench kitchen cupboard - this pull-out unit stores so much more and makes everything convenient and accessible. And its SOFT CLOSE feature means a gentle push and the pull-out cupboard gently returns and closes by itself. Many customers liken the convenience of this innovative product to thier larger pull-out pantry. It is perfect to put near your food preparation area as it can house a chopping board, knives, frequently used utensils, sauces and oils on the top level. The middle and bottom shelves are great for larger cooking items, utensils, scales, measuring cups, crockery - they all become so accessible in a pull-out unit. No more fishing around the back of a cupboard or having to take everything out to access something at the back! Install with the cupboard door attached to the front of the unit so the door pulls the unit out for the latest in modern kitchen design (convenient mounting holes are provided on the unit for this option).